The shower is the best starting place for any bathroom remodeling. A bathroom has different functions. Bathing, washing your hands, relieving yourself, applying makeup, shaving and cleaning-up are all examples of things you do in a bathroom. The name bathroom implies that this is a room where there is a bath or, where a bath has been replaced with a shower. However, a bathroom doesn't actually have to have a bath or a shower because a half or quarter bathroom doesn't have either. When you think of a bedroom you think of a room with a bed in it. When you think of a bathroom you think of a room with a bath or shower, in it. The shower or bath, is then an integral part of a bathroom. Though a bathroom can still be a bathroom without a shower, a shower-less bathroom is not considered a full bathroom. So the shower or bath, is the best place to start with any bathroom remodeling design. Decide what your favorite bathing fixture would be, a stand-alone shower, a bath and shower combo, a stand-alone bath, or a Jacuzzi and build your bathroom design around that. Simply updating your bathroom walls can be your entire bathroom remodeling design. 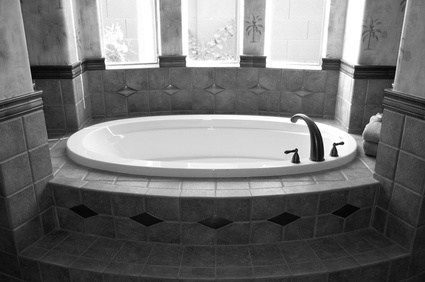 It is the easiest, quickest and least expensive way to remodel your bathroom. The easiest wall change is to paint the walls a different color. Add wallpaper if you don't already have it or change the one you have if you prefer wallpaper over paint. Bathroom walls are subject to a lot of moisture so instead of painting the walls you can cover them with tile all the way up to the ceiling or just half-way up. Adding beadboard also gives your walls a unique and classic look. One of the most important features in a bathroom is space. No matter what size bathroom you have, when coming up with your bathroom remodeling design make sure you put in as much open space as you can fit in. For a smaller bathroom, fixtures such as corner showers, pedestal sinks, wall-mounted vanities and floating shelves will help add more open space. If you have a larger bathroom, make sure you don't give in to the urge of filling every space.